Want to improve your guitar playing skills? Want to learn how to play guitar like a pro? Then you’ll want to learn from the best online guitar lessons! But with so many options to choose from, which one will really help you learn guitar fastest? This is what I’m going to show you today. On this page you’ll discover the best way to learn the guitar and improve your skills. If you don’t want to waste time and simply want access thousands of guitar lessons right now, click here* for a great set of lesson. All supply good quality online guitar lessons, but each also has their set of pros and cons. I’ve been through all of them, and have given my honest review below. So, let’s get into it. 2. 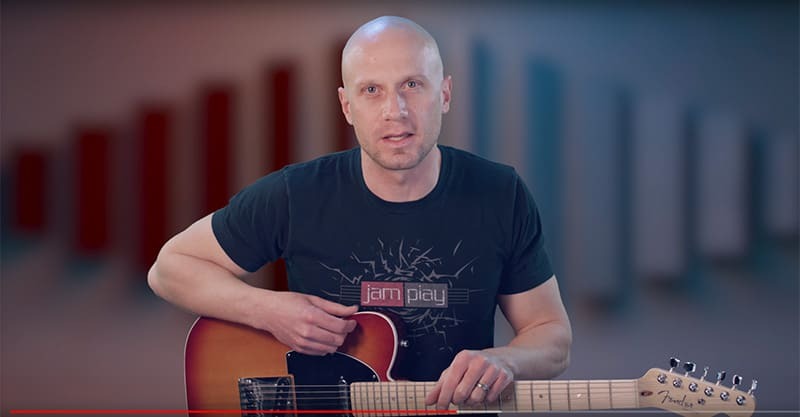 JamPlay Review, Are These The Best Electric Guitar Training Videos On The Internet? 3. 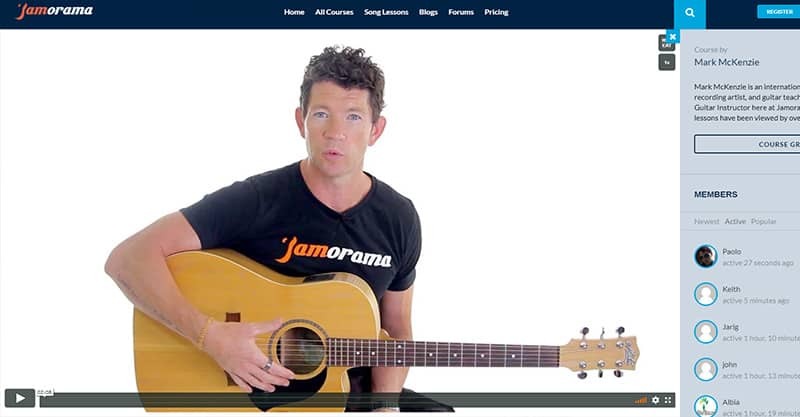 Jamorama Review, The Best Cheap Acoustic Guitar Lessons Online? 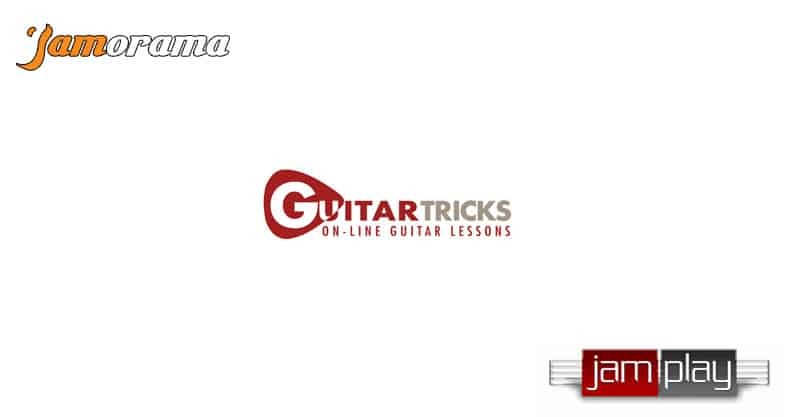 Guitar Tricks Vs JamPlay Vs Jamorama, Which Has The Best Online Guitar Lessons? Can You Teach Yourself Acoustic Guitar? Are There Any Free Guitar Lessons Available Online? Guitar Tricks: Click to get your 8000+ free trial lessons now. Guitar Tricks are one of the top players in the online guitar lessons space. Not only do they offer thousands of lessons to learn from, but the whole site is well laid out and easy to find what you need. You’d be hard pressed not to find a tutorial you want, but on the off chance you do, you can always request it be made. They’re adding hours of new video tutorials for guitarists each and every month, so this website will only get better. One of the bonuses included with Guitar Tricks is the Song Builder’s Toolbox. This is tuition on writing better songs and is delivered by Lisa McCormick. So let’s move on to the hard stats. Guitar Tricks Pros: Offers a free trial through the above link so you get to test it out first. They also teach you guitar based on the style of music you make (e.g. rock, country, blues etc). Guitar Tricks Cons: To be honest, I’m clutching at straws to say there are any real cons to the actual lessons offered here. That said, in terms of the site, Guitar Tricks doesn’t yet offer the ability to take notes like JamPlay below does. Number Of Guitar Lessons: 8,000 plus at the time of writing this with an average of 11 hours of new video being recorded per month. HD Video Guitar Lessons: Yes. Tutors: Over 45, so you can choose the ones which you prefer. Price: Free for 14 days if you go through the above link. $14.95 per month after that. They also have a much reduced yearly option for $129. You can look inside the members area if you want a better idea of what Guitar Tricks has to offer (video included). JamPlay* (click to see their guitar lessons) is another one of the big providers of guitar lessons online. Their guitar tutorials are always of the highest quality, and are easy to follow along with. While they haven’t currently got as many lessons as Guitar Tricks, quality wise, they’re on par with them. They also have more supporting materials for each video than GT does. A good feature of JamPlay is that you can keep track of what stage of the guitar lessons you’re at easily in their dashboard. Furthermore, and this is an option which most others don’t offer: you can also take personal notes beside each lesson and store them there for you to refer back to. While not everyone will use this, this is a feature that I’m sure many (like myself) will find very useful. JamPlay offer a lot of lesson at a good price, so they’re definitely up there with the best. JamPlay Pros: Easy to follow along to videos, tutors online daily to help you out, and lots of supporting materials for each video. JamPlay Cons: Not as many lessons as Guitar Tricks. That said, 4000+ lessons is still more than enough for most. At $19.99 a month they’re also the most expensive of the three, but as I’ve secured you a discount code below, that’s not really much of an issue. Number Of Guitar Lessons: 4,395 at the time of writing this with an average of 11 hours of new video being recorded per month (according to them). Tutors: Multiple, so pick your favorite. Price: $19.99 a month. They also offer a reduced price quarterly membership for $49.95 and a yearly one for $139.95. These are all cheaper when you add the money off coupon codes below. Update: I’ve now managed to secure you some big discount coupon codes for JamPlay! If you go for their guitar tuition videos, enter either 33C6CE for 10% off monthly, or 1BA1E2 for 25% off first month. For their online bass guitar videos, use either 0713E7D01A for 25% off the first month or 4B926862C0 for 10% off monthly and yearly. You can see a more full on Jamplay review here. 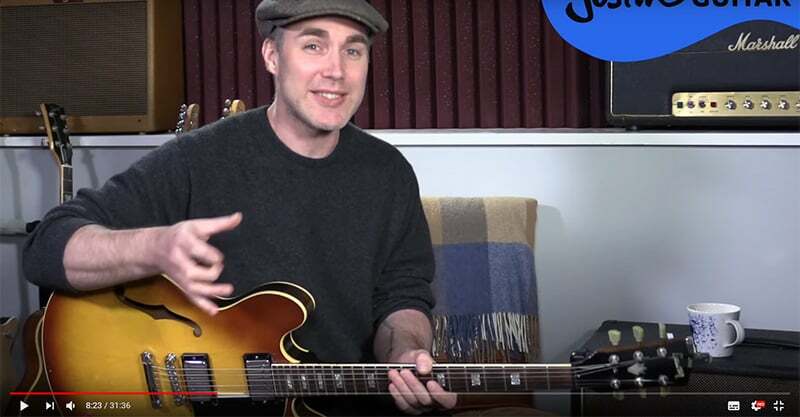 Jamorama* (click for their lessons) is one of the first guitar teaching sites I came across many years ago. They’ve been around for a long time, and have taught many aspiring guitarists such as yourself along the way. Unlike the other two options, they focus on one on one work with your tutor. Not in terms of meeting up with them personally, but in term of it being one person doing all the videos: Mark McKenzie. According to their site, they’ve taught over 250,000 people guitar. One thing’s for sure, they have a lot of experience in teaching, so they might be a good choice for you. 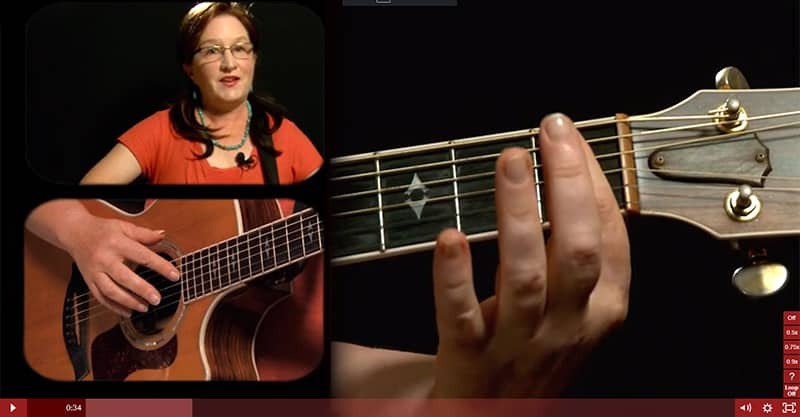 Jamorama Pros: Cheaper than the other acoustic online guitar lessons, so ideal if you’re on a low budget. Mark McKenzie is a likable tutor. Jamorama Cons: Not as many lessons as they other options. Jamorama offers hundreds of videos instead of thousands. Number Of Guitar Lessons: Hundreds. Price: $10 per month, or save 50% and get a yearly membership for $60. All three of the above provide top quality guitar lessons for both beginner and intermediate guitarists. But which one should you choose? I’ve compared them all, and in all honesty, there’s no right or wrong answer here. Essentially, it comes down to your personal situation, but based on that, I can help you decide which you should get. I want a mix of lots of high quality lessons, a good price, and a nice big free trial. I like my top guitar lessons to come with lots of additional training material and features, and I don’t mind paying that bit more for those benefits. I need some good quality lessons on a budget of no more than $10 per month, and don’t mind having less if I save money. In the battle of Jamplay vs Guitar Tricks vs Jamorama, they all have their strengths and weaknesses. But have a look at the above details and you should see which one is best for you. If this section isn’t relevant to you (e.g. you’re not a child or don’t have children who want to learn guitar) feel free to stop reading and get started with your guitar videos. Now, I wanted to touch on learning guitar for children and young adults. Are the above mentioned guitar lessons suitable for kids? The simple answer: yes, they’re more than usable for kids. Due to the lack of reading involved, it’s simply a case of watching the training videos and following along. As long as they know how to operate the video buttons on a computer they’ll be able to follow along. If anything, the online lessons are ideal for them. Due to you being able to rewind and watch them as often as needed, they can keep going back over lessons as many times as they need. This will help each technique sink in. And there aren’t a huge amount of teachers who teach electric guitar lessons for kids; online you won’t have a problem finding this style of learning. 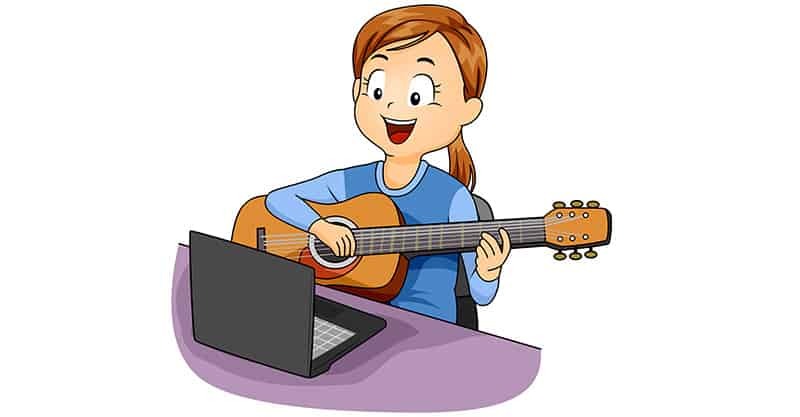 So if you have a child who wants to learn guitar, get them some beginner guitar lessons for kids; Jamorama, Guitar Tricks and JamPlay are all a good choice. Now, before we go any further though, I want to clear up a common misconception. 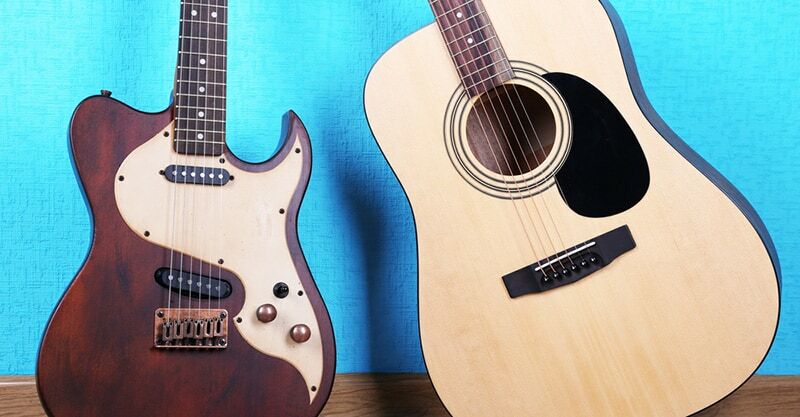 So you know you want to learn, but can you teach yourself to play guitar? One of the biggest mistakes you can make when trying to to learn guitar is trying to teach yourself. Guitar playing isn’t one of those things you can just learn through trial and error, there are base skills you need to learn which will shape how fast you pick everything up. From the correct finger movements,to how to read guitar tabs and the like. The mistake many make however is trying to learn from random Youtube videos. While this method can teach you a few techniques, the lessons aren’t structured so people often end up missing out on important things. A worse option yet, some try to pick up everything by strumming away using trial and error. This will literally waste months of your time as you don’t have a solid foundation to build your skills from. I’ve found the best way to learn guitar is to have properly structured lessons. If you want to properly learn how to play guitar like a pro, getting professional lessons isn’t optional. So forget searching how to teach yourself guitar, instead get guidance from proven guitar playing teachers and take things from there. Maybe if you learn how to properly play guitar, down the line you can go on to teach guitar online yourself. Getting beginner or intermediate guitar lessons online, ones like those I mentioned at the beginning of this guide. So which is the better option? While everyone has their own preference, if you’re on a budget I suggest online guitar lessons every time. The thing is, guitar teachers are usually out of the budget of most guitarists. One on one guitar lessons can cost anything from $29 for a half a hour session, to in excess of $50 for the same amount of time. If you want a guitar teacher for an hour that price will double. In essence, you’re paying for the person’s personal time, which ads to the cost. You’re not paying to learn special skills only they can teach. Online guitar lessons however are a lot cheaper due to the fact they don’t require someone to come and teach you in person. They’re cheaper. While 1 on 1 guitar lessons often start from at least $29 for 30 minutes, you can trial 8,000+ guitar teaching videos for free. You can learn more. With guitar teaching videos you can skip through and learn what is specifically relevant for you and what you want to achieve. As I mentioned, with the best online guitar lessons you have thousands of videos to choose from. It doesn’t matter if you play classic guitar, bass guitar, electric guitar, jazz guitar or blues guitar; they’ll have something to suit you. Multiple teachers. Most guitar video lesson bundles are taught by various people. This means you get knowledge and guidance from a number of qualified teachers over just one. Learn guitar at your own pace. 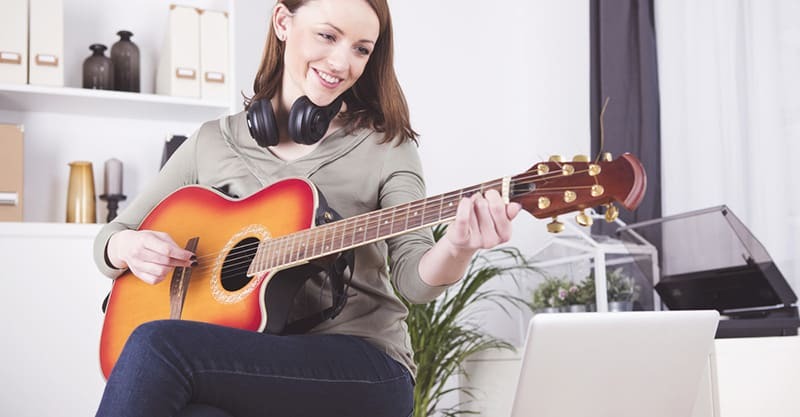 While guitar tutors are usually only limited to say one or two lessons a week, you can access online ones as often as you want. 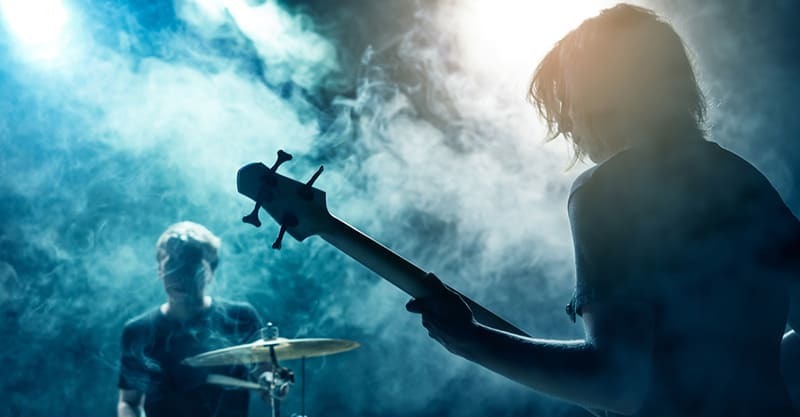 If you want to learn to play bass guitar fast and dedicate 8 hours a day to it, you can do that. With a one on one teacher, the cost of this would add up very fast. If like most people you’re budget conscious and haven’t got a small fortune to hire a private guitar tutor, your best best is to find online guitar lessons. 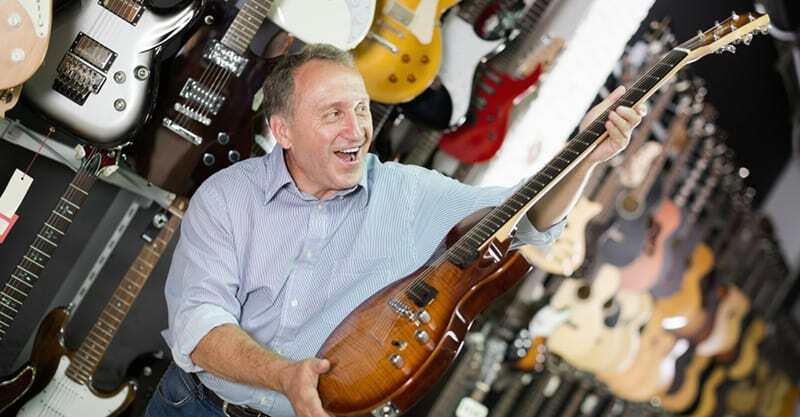 If you do still want to find a guitar tutor however, see how to choose one. 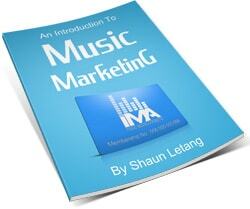 So far we’ve looked at premium, top quality guitar lessons. This is because they’ve been proven to help thousands of people learn guitar in an easy to understand and logial manner. But what if you’ve not a cent to spend on training but you want to start learning anyway? Are there any good free guitar videos out there? Guitar Tricks actually offer free guitar lessons when you first sign up. These will give you a taster of their teaching style and allow you to get a feel for the platform. The Justin Guitar website has a lot of free videos to get you started with the basics, as well as some more advanced material. I’d suggest you check out his Youtube channel as a good starting point. Another website which offers free lessons is Guitar Compass. They offer both free and premium guitar lessons, so try out their free offering and see what you think. While Guitar Lessons offers a premium course, they also have plenty of free lessons available too. Finally, if you’re from the UK, you might relate well to Andy. He’s another who has a strong Youtube channel, and regularly uploads new video lessons. 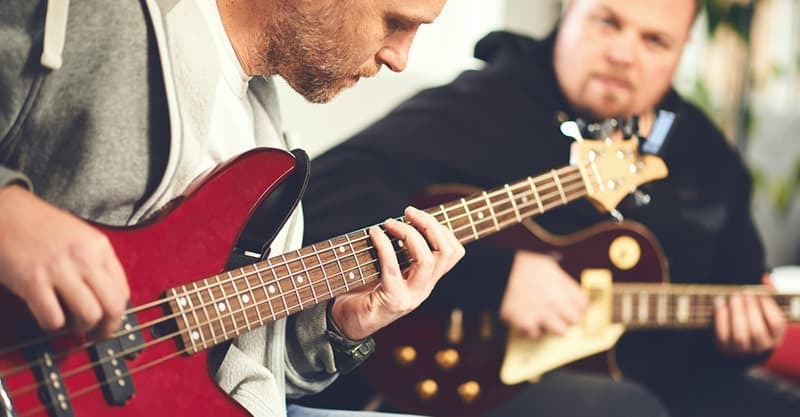 Unless you’ve got a professional guitarist in the family who’s happy spending weeks and months teaching you everything they know, the best way to learn guitar is via online lessons. Not only are they easy to access whenever you want, but they’re in-depth, taught by professionals, and you can learn guitar at home in your underwear (if you so choose). While you can always upgrade guitar in future, you should at least do some research into which guitar to buy when you’re a beginner. Not all guitars are made equally, so the last thing you’ll want to do its get one which makes the learning process a lot harder. I’ve written a guide on choosing a guitar for newbies, so have a look at that if you haven’t already chosen one. You shouldn’t go for the world’s best model at this stage, but you should get one which can help you learn guitar more easily. You can be taught by the best online guitar tutor ever, but if you don’t put the work in to learn your craft, it’s not going to count for much. If you’re serious about taking your guitar playing skills to the next level, the above should help you out. Whether you’re after adult, teen or child friendly guitar lessons, the guitar courses mentioned can help. 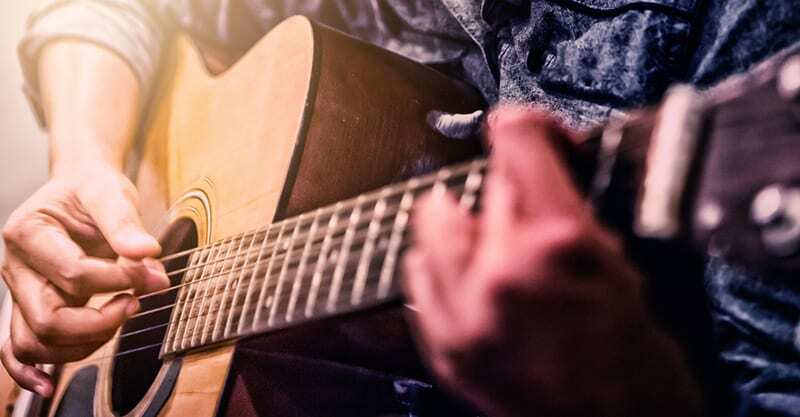 Learning to play guitar like Ed Sheeran, Bob Dylan or your favorite guitarist can greatly be sped up with proper tuition. So, do you have any questions or comments about any of the above? * The links on this page to the online guitar courses are affiliate links. While they don’t cost you anything to use (and you’ll often get a discount for using my link) I’m compensated if you choose to buy any of the above. This doesn’t influence my decision to recommend them in any way; I’ve used all of the online guitar lessons mentioned here and genuinely feel they’ll help you learn guitar. P.S. If you want to talk to other guitarists about this topic or others (link to this page so they know what you’re referring to), you might want to check out a guitar forum. This can allow you to get advice other than via videos, which can be great help during your training. Great article! I’ve always wanted to learn guitar. There are many online courses but the ones you review are definitely top tier. I myself had some experience with JamPlay and to be honest I was really blown away by the quality of their lessons. I am just trying to learn a few songs from Sheryl Crows first album, if you possibly can guide me I would greatly appreciate it. See the love of my life loves Sheryl Crow, so I want to learn at least one if not more to play to her. Please help – thanks so much. Can i learn theory through Jamorama lessons so that I can eventually learn to write and play my own songs? I’m older, and have trouble keeping up. I get frustrated but want to learn. I’m ready to pick an online system, but which one would you recommend? I want a teacher that shows they like what they are teaching. Thank you. Any of the above systems will be good for you, as they’re video based they’re much easier to follow than text lessons. It’ll just depend on white you’re most after; a good price, more quality lessons, or a mix of both. Thank you for the comparison Shaun. Bookmarked! Thank you Shaun, that’s helped. I’ll check them out. Thanks for your well done article. So, enough said… On to playing and learning and getting better one day at a time! Do these lessons work if you are new to guitar? My daughter wants to learn how to play so I am looking for something online as I think that will be easiest. Hi Lizzie. Yes the above would be a good fit for your daughter, there are plenty of beginner guitar lessons in each of those courses. At 14 she’s a good age to pick up guitar too. Wish her good luck for me. I actually joined Guitar Tricks after reading this, I’m already part of Jamorama too but wanted to get all the additional videos. So thanks for the recommendations. Disclosure: If you go on to use any of the guitar lessons mentioned on this page I will be compensated for recommending you. This won’t cost you any additional money, and it doesn’t influence which lessons I talk about. As you’ll see below I’ve actually signed up and been a member of all these online guitar lessons, so all recommendations are genuine.